Hi everyone! I cannot believe that it have been over a year since I have posted to my blog. Crazy Sauce! I am not one to give excuses but I do feel terrible that I have neglected it so much. I do still create jewelry. Not as much as I would like, but I do still dabble every now and then. That being said I would like to start dabbling a bit more. A lot of things have changed. As for my health it is better than what it was. Still dealing with a few issues here and there but nothing very serious. I continue to try to get my mind in a better place and that is always a struggle. I have good days and bad, but it is improving. I went back to work at Harbor Freight Tools. I love my job and the people there, I just hate all the heavy lifting that I have to do. The hours that I work can be rather crazy as well and that is always an adjustment. I loved working on cell phones and computers at my last job but HFT pays me almost twice as much as what I was making there so that will help feed my bead addiction. And let's face it, more beads mean more inspiration so that is always a plus. I really miss my beading friends. Especially my friends from the wonderful Creative Bead Chat Group on Facebook. I am sorry. It was never my intention to cut everyone off the way that I did. I was mentally in a bad place and had to dig myself out of the darkness. When that happens I tend to cut everyone and everything that I enjoy doing off. To go ahead and clear up the mental issues that I have so that everyone knows I might as well tell you what I struggle with. I am Bipolar. I choose not to be medicated. I have struggled with it for so long now that I have basically trained myself to recognize the symptoms and to avoid certain triggers. It does not always work, but it is much better than having to take tons of medicines that make me feel less than human. 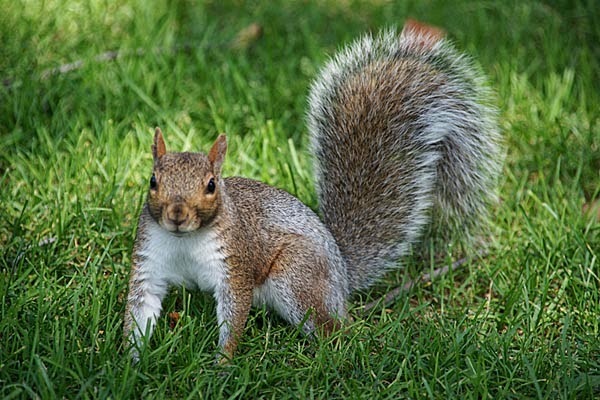 SQUIRREL! Oops my ADHD kicked in. Sorry about that ;) I am doing better. Making progress. Moving on. I would like to give a very special thanks to Lori Anderson. I do not know if you remember that phone call that we shared a year ago, but woman, you saved my life. Thank you! So anyway that is basically where I am right now. If you have read this giant wall of text I have to give you kudos. Expect to see more posts soon. I actually signed up for a blog hop! I am very excited, but nervous, about that. The link is here on the page, please check it out. It's a huge step for me in the right direction and I am so excited that I was picked for it. I need some help finding a blog reader so that I can get back into the swing of things. When Google's Reader went bye bye I was and still am completely lost. So what do you use to follow and read your blogs. I miss them so! One day I received a wonderful surprise in the mail from Therese of Therese's Treasures. I opened it up to see some wonderful handmade beads and a cabochon along with an invitation to join Therese and a few others for Therese's Birthday Surprise Challenge. Therese sent this to all of the women that she has been able to meet in person in the beading community. I was lucky enough to get to meet her earlier this year, it was a fantastic trip and Therese is as nice in person as she is on her Blog. Therese was actually one of the first Blogs that I started to follow and I love seeing her lovely work and reading about her life. She is always so helpful and inspiring to me. This Hop, in fact, is a wonderful example of that. You see, today is Therese's birthday, and she sent all of us these wonderful Bead sets from Golem Studios. Personally I cannot say I know many people that would send someone else a present on their birthday, that is how awesome and kind she is. She is always there with an encouraging word or gesture when you need it and often times when you don't. She truly has a heart of gold! I <3 you Therese! I wish you many blessings, not only for your birthday, but for every day that you have! I had to have a photo with the infamous chair! I have to admit that I really had no idea what I wanted to do right up to the last minute. I started this piece on Wednesday at about lunch and finished it just in time to take a photo of it at dusk on Thursday. The beaded beads I used in the band were designed by Kelly Dale. I am a big fan of Kelly and for all the she does for the beading community. Kelly runs a YouTube channel called "Off The Beaded Path" where every week she uploads a new video tutorial. I have to admit I would have never been able to pick up beadweaving like I have without Kellys wonderful video tutorials. Kelly last month uploaded a video called "Meridian Earrings" that was made using these beaded beads and joining them together with Crystal Montees. These beaded beads remind me of little pillows and they are really simple to weave up. That is when inspiration hit! Right at the very last minute! Yay! I did not use the large round beads that matched the cabochon because I had planned to try to make some earrings with them. However I just ran out of time. I am so sorry Therese! I do promise to use them sometime in the near future and share that design as well as soon as it is finished. Thank you all so much for visiting us for this wonderful blog hop in Therese's honor! Be sure to take a few minutes out of your busy schedule and please wish Therese a Happy Birthday! She is truly deserving of it! Don't forget to check out what the others made in her honor as well! Therese Frank <--------- The Lovely Birthday Girl! Welcome to the Window Shop Holiday Blog Hop! This wonderful idea came from the lovely Rita of Jewel School Friends. She challenged us to create a "Holiday Window" for our shop -- share our handcrafted shop information, product line, and links to our online stores for the Holiday season shoppers. Sounds pretty simple right? Unless you are like me and my shop is still closed. /sigh. I had surgery on Halloween and it has pretty much put me out of comission on getting my shop back up and running again. That being said I have been busy creating stuff to stock the shop with. So since I do not have a shop I thought I would share with you a few of my favorite handmade shops. So grab a cup of hot chocolate and if you just happen to find something perfect for you or a friend, tell them I sent you lol! The first shop I would like to introduce you to is RoEnchantedDesigns on Artfire. Rose makes really lovely jewelry and I just happen to own several of her pieces. In fact I recently bought a necklace from her to send to my mother for Christmas. RoEnchanted Designs is truly enchanted and I love the bits of whimsy and romance in each piece. Oh and did I mention how affordable her work is? Her handmade art pieces are a steal! Be sure to stop by and see all the other wonderful work she has HERE. And everything she sends comes in Amazing Gift Boxes that are a piece of art alone. I am planning on having her make me some to use for my shop once it gets going again. Next up is Janet of Pink Poppy Studio. I just love love love her jewelry. Her work is understated pieces of art that often feature gemstones and other fine materials that is inspired by nature. I do not own any of her work yet, but I have several of her pieces on my wishlist. (hint hint ha!). I am going to let her wonderful handmade jewelry speak for itself. Isn't her work amazing!? Be sure to check out her shop by clicking HERE. I really love her nature inspired work, and what woman is not a sucker for natural gemstones and sterling silver. These beautiful organic pieces would be fantastic under a Christmas Tree or in a stocking! And last but not least I would like to introduce you to TangleWood Thicket. by Kasey Sorsby. TangleWood Thicket is home to most things winged, magical and whimsical. Here you'll find OOAK (One of a kind) Needle Felted Soft Sculptures. This is another shop that is on my wishlist. I just love the bright colors and sweet faces that her pieces has. Once again I am going to let the pictures speak for themself. See what I mean? Ah-maz-ing! I would love love love to own one of these wonderful custom made pieces of art. 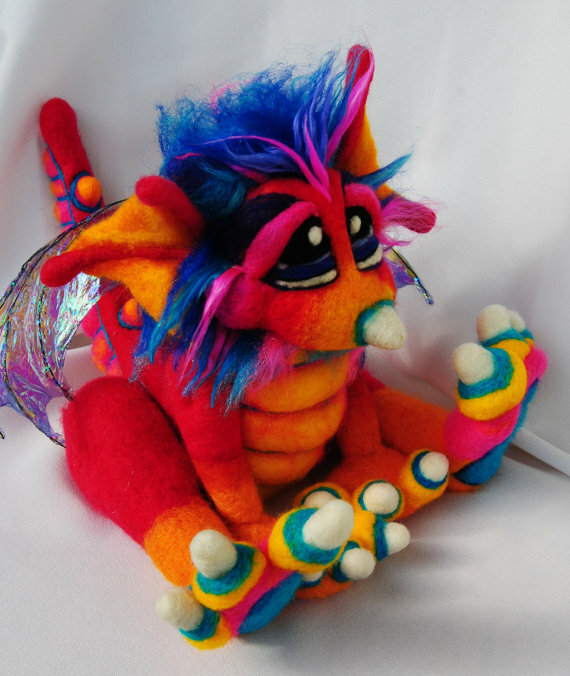 I love the vibrant colors, all the details, and the fantasy theme (I love dragons)! One day I will have one of these babies sitting on my bed waiting to greet me when I go to bed. You can see more of her custom work by clicking HERE. I could go on and on sharing all the wonderful shops that are out there that make amazing handmade pieces of art. Handmade artisans put so much love and time into their work. By buying handmade you can buy with confidence. No more worrying about sweat shops and child labor. And while I cannot speak for every handmade artist, I feel pretty confident that most of them will stand behind their craftsmanship 100%. So this Holiday Season, spread the love by buying handmade! P.S. All photos belong to the original photographers! Therese and Christine have done it again! This time they paired up to continue on their "A Time To Stitch" Blog hop series. The first time these lovely ladies hosted this hop was back in June. The last time the challenge was to make something using Herringbone or Peyote or both. If you would like to take a trip back in time to see what I made you can click HERE. The next two pieces are made using RAW, which I happen to love by the way! This bracelet was made following a patten by Ella from http://ellad2.com. Ella's patterns actually taught me RAW and she makes/writes such fantastic tutorials that even a newbie can follow. I made this bracelet using 4mm Jasper Rounds and 11/0 seed beads with a natural wood button. I just love the way it turned out! And last of all is this Hollow Core Beaded Bead I made that also uses RAW. I found the tutorial for this @ Beadaholique's YouTube Channel. If you would like to learn how to make this bead you can click HERE. It is a great tutorial and you should totally check it out! Marla Gibson <----- You Are Here! p.s. sorry for the crappy photos! I have had these made for a while now, but I just photographed them and I am a bit under the weather. for a contest that Glidden Paint is doing called the Colorful Classrooms Contest! Glidden® Paint will donate up to 200 gallons to transform one lucky elementary school into a brighter, more colorful place to learn and grow. This is a fantastic school! My daughter is dyslexic and they have really helped her with it and she now reads at her age level! They have been fantastic in helping us with any concerns that we might have. Saltillo School District is also a Mississippi Arts Commission, Whole Arts School. What that means is that they teach through strengthening education in and through the arts by promoting sequential, comprehensive arts education in grades K–12. I will be honest and say we bought our house in this town because of this school district! My daughter takes Drama in the area they show on the video in fact. You can learn more about the school by clicking here. So please help Saltillo Elementry School win by voting one time HERE! One single click of a mouse button can make a world of difference in 800 childrens' lives!